This was for two people, my husband and I, as we both work retail with extra long hours had to go to work at 2:00 pm to open our stores by 4:00 pm. This didn't stop us from having a thankful and wonderful brunch. Was a totally appreciated brunch and still gave us much needed holiday cheer. 14 hour + work day without a problem! Place the turkey sliced in a oven proof 2 quart dish. Pour both jars of the gravy over it adding the white wine ( I used Chablis). Add some butter to the corn to another oven proof dish. Heat in the microwave or oven. In a medium sized oven proof dish, add the sweet potatoes and mash with a fork. Add 1 tablespoon each brown sugar, butter and a pinch of cinnamon and stir together. Add some marshmallows to cover the top. Bake the sweet potatoes until warm and top of marshmallows are browned. Heat the store bought potatoes in the microwave until hot or make your own. Place one thick slice of bread on the plate. 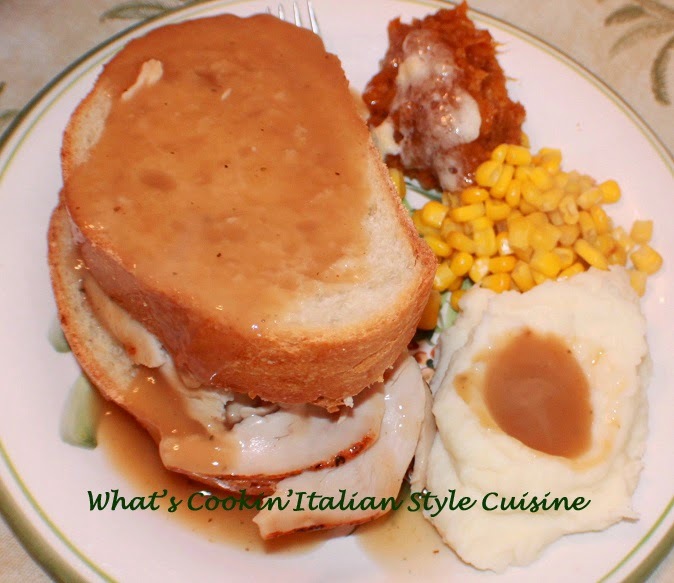 Top with turkey and some gravy poured on top of the bread. Add another thick slice of bread on top, add more gravy. Place the potatoes on the plate next to the sandwich, making a well in the center, add gravy to the center well. Of course you can make some stuffing from a store bought package as well to add to the festive plate.